summer residents, originally uploaded by jahansell. It's a fact of life in spring and early summer: every field has its flock of summer folk. These are in residence at my kids' school in Lakeville. No chicks yet, but enough poop that it discourages much outdoor play in that area! They are fun to watch. Couples mate for life, and one always stands guard while the others eat. They'll waddle away slowly as you get nearer (though when I was in Pennsylvania, I was jogging along the canal in Yardley (w/o camera, alas) and 2 geese and a swan were hanging out there - I got within a foot or two of them. It would have been amazing to photograph the swan, but I was somewhat scared of him, too - they're much meaner than geese! Anyway, one other interesting factoid about geese: they can have a dozen or more babies, and I believe one might adopt or coopt the brood of another, combining them into one master flock! Great photo and info. Never knew they could have so many babies! Neat photo. Looks like their running up the hill for something. 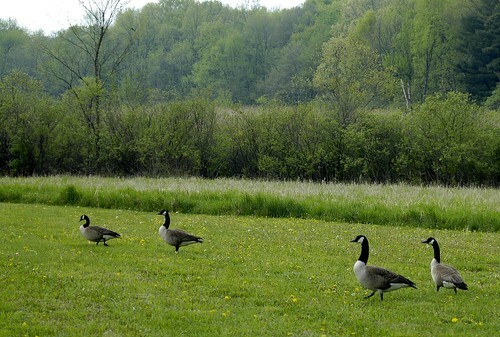 It looks to me like the taller grass behind them is what attracted them. It looks to be in seed and the geese will strip off the seeds for food. They do that here too.